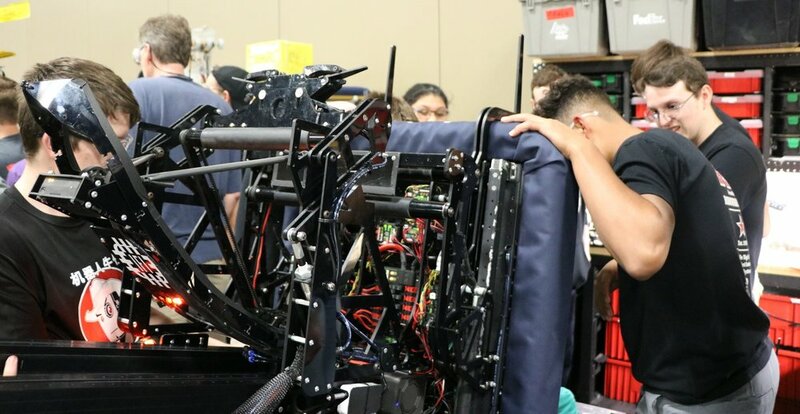 FRC teams in the state of Texas competed under the “District Model” for the first time in 2019. As such (for the first time) all the top teams would face off at the TEXAS STATE CHAMPIONSHIP before sending our best robots to represent our state on the World Stage. After a successful (but tough) weekend struggling through the Dallas district the Robowranglers were tired and disappointed with our performance. Even after two district wins, we were worried how Overhang would fare against the greatest teams in Texas. Would we be able to recover from our step-backward in Dallas? Would we be able to fight through this incredibly deep event which included at least two of the “Top 25” teams in the world? Improve our Disc Grabbing “Beak” - Upgrade our Autonomous Options - Make Overhang, Overhang. Things went very quickly. By the time we met for our Dallas Post Mortem meeting, the new revision of our Beak subsystem was already assembled and was almost ready for testing. What did we change on the beak? A few things. First, we needed to remove any “slop” from the linkages in the system. We did this through a quick redesign of the linkages so the actuators would take-up any slop at the end of their travel. We also paid more attention to the assembly of the beak linkages - and became snobs about how tightly the pins were installed and how much “hole clearance drilling” was done during assembly. Secondly, we needed to increase the holding force once the beak had a disc in its grip. We did this by adding a 2nd pneumatic cylinder (2 actuators is a fast way to double the force) and by changing the linkage geometry. The beak subsystem is modular, and thankfully the new design fit in the same location as the old design. This meant - the new beak was an easy swap! What did we change about our autonomous options? I mean… mostly, we changed the beak. We never really got to test our 2-disc autons in Dallas because we kept missing the “grab” for the 2nd disc. The biggest change we made was to our starting location. In Dallas we started from Hab level 1, but for Texas State Championship we wanted to be able to start on Hab level 2 (and take those extra 3 points a match). Our autonomous modes would turn out to be fairly consistent, but still not quite getting to “2 discs”. We consistently scored 1 disc, grabbed a 2nd and then got into position… but we need to speed things up before the World Championship. Seems like we can adjust our paths to save lots of time. What did we change about our End Game? We named the robot “OVERHANG” and no one even asked us why. Maybe our plan was obvious? Load-in at the Austin event was on Wednesday afternoon. (We finished in Dallas on Sunday evening). Our team hit the ground running with a lengthy to-do list. The most important thing? We needed to finish our “Change the Oil” protocol from Dallas. Our pit crew only got halfway through replacing the control system components on the robot before we packed-up in Dallas, so there was a lot of “finish wiring it up” going on when the bag opened up in Austin. It was immediately evident how incredibly DEEP this event would be. It was also immediately evident how intimate this event would be. What do I mean by this? (Marco from 3005 described the event as “cozy”). Well… there were 64 incredible teams crammed into a venue appropriate for 24. Intimate. Incredible. While the venue setup was weird it did provide a unique experience. We had executive sponsors next to school administrators should to shoulder in the “standing room only” section. We had CEO’s hip to hip with student-scouts in the bleachers. At one point I looked over and saw IFI’s CFO standing behind the scoring table next to the Principal of our HS in a crowd of approximately 148,000 people. This was pretty cool. What a crowd! The atmosphere was electric, and part of the energy was probably driven by the close proximity. I can’t exaggerate how deep the talent was at TX States. There were robots not picked who could (and will) captain alliances in a division at Worlds. Someone was talking to me about how TX needs to increase the size of the state championship and split it into multiple divisions - I vehemently hope they do NOT do this. It was GREAT to play this game with some serious firepower on the field in almost every match. Don’t dilute the premier event! I didn’t realize I’ve turned into a grumpy old-timer, but again and again I’m finding myself struggling to adapt to the “new” way of doing things. I’ve been doing FRC since the 2000 season. As such, I find myself running on autopilot based on “the way things have been done”. A Saturday-Sunday 2 day district event? That’s weird. A 4-day State Championship? That’s weird. Playing both of those back-to-back? My body has no idea what’s going on and doesn’t know if it should be prepping for elims or doing robot enhancement work… or sleeping. Of course, we couldn’t help ourselves: we brought Drivethru down and introduced it to it’s cousin Flyby. As soon as we saw 118-148 would have a “mega pit” we realized we had a special opportunity. What’s funnier - the event staff asked us if we’d display the robot in the lobby of the event center. It looked great out front, and every time I walked there were people studying it. We did get two practice matches, and had a decent amount of confidence in our upgrade work by the time qualifications started. When the match schedule came out, we felt pretty good. One of things we’ve emphasized this season has been conservative play. In Amarillo I told our drivers “the team who makes the least mistakes will be the one who comes out on top.” I believe this will be true at every event this season. There were definitely times 148 “lost the battle, to win the war”. Many FRC coaches have probably already seen this tradeoff’s most obvious example: Do we go for the rocket RP this match? How long do we try for it before just focussing on points? My personal favorite example of this? 148 - Professional Decoys Since 2018. Our original build season design goal for our robot was to have an “after the buzzer, double climb.” We hoped that one of our partners would climb up onto the platform, then at the last second we would be able to position ourselves and climb after the buzzer. We DID have it when it mattered! We figured this would be a pretty cool power-move. Unfortunately, we struggled to get the after-the-buzzer (gas shock driven) climb working. We realized even if we got it working perfectly, the “climb next to someone” would be very difficult without providing some means for the drivers to adjust. This is why we abandoned it and rebuilt our end-game for Amarillo. So how did we climb next to partners? We added a pair of polycarbonate forks which pop-out from the front of the robot. These are designed to slide underneath a partner robot on the level 3 platform such that they support some of our weight when we lift our feet. With the right partner, we can climb up like normal - insert the forks, and lift our feet while we OVERHANG the platform. This is dependent on the size, weight, and CG of our partner robot - but it’s surprisingly versatile! (We would go on to double-climb with 118, 1477, and 3310 in competition matches as well as numerous others on the practice field). I love how invisible these forks are when they’re tucked in. I had people come by and ask to see them and get confused when I said “They’re right there.” I typically need to touch one in order for folks to notice them. It was VERY satisfying to finally get this mechanism installed. We basically designed the whole robot around having something like this, and it’s been frustrating to suffer from the robot tradeoffs we made while the “benefit” of those tradeoffs was only half-done sitting on a bench in Greenville. We knew the climber forks would work with 3310 due to the geometry of their robot, but we were also hoping it would work with the Robonauts’ Flyby. When we saw we’d be together with 118 in Qual Match #95 on Friday evening, we knew it would be a good first test for the forks. After a few quick tests on the practice field, we were good to go! Of course we all really wanted to see the double climb for the first time. But… I didn’t forget my own advice about “conservative strategy” (and neither did Justin the coach of 118). We wouldn’t risk the double climb unless we were very confident that the match was won, and we’d already gotten the rocket RP. All that buildup… and it turned out to be pretty easy and straightforward. There were several other double climbs in matches within the hour. 148 would go on to do it in our match with 1477, and do it on the practice field with a number of teams. As I said, this event was VERY deep. At the end of qualification on Friday we were #1 seed by the skin of our teeth. We were tied in RPs with 118 and 4587, but had a slight advantage in the “Balls Scored” ranking tiebreaker. Interestingly, after looking at the standings we weren’t sure if #1 seed was the spot to be. We knew some VERY tough alliances would develop in the middle and bottom of the pack due to the Serpentine draft. How much drop-off would there be in the 3rd robot options? We’ve been at events before where the difference between robot #23 and robot #24 is astronomical… If we don’t get #1, would we decline a selection and play from the middle of the top 8? In particular, we were excited about Qualification Match 111 with FRC3005 and FRC2468. Each of our three teams could solo a rocket. Each had a level 3 climber… and 2468 was “fork compatible” for an Overhang double-climb. We were excited. It was a lot of fun. This was the first match in Texas where both rockets were filled. 3005 doing one on their own, 2468 fighting past a defender to get another, and 148 doing cargo-ship and supporting 2468 against the defense. For me, it was amazing coaching with both Norm and Marco. We ended up setting the high-score for qualification matches (a record which would be topped by 2056 and 1241 less than a day later). Our big disappointment? The defender was getting penalized for hanging out of frame perimeter for the whole match. If they had realized this and left our side of the field… we probably could have gotten a much higher unpenalized score (even if the overall score would have been lower)! We also probably would have had time to do the double climb with 2468. Ahh well, maybe we’ll get another chance next week? Note the “Safety” Glasses 1477 gave our team (on the back of Josh’s hat). Yes… they’re exactly what you think they are. After 12 qualification matches, we ended up at the top of the seedings. It was VERY close. Not one of those “we got this…” type events, but a nail-biter down to the end. Even more close than the fight for top seed, was the decision over who would be first pick. Do we pick our #TeamIFI bros and Amarillo partners 3310? Do we “Give the People What They Want” by bringing back the #SpaceCowboys and pick 118? We had a really strong match with Appreciate… do we go with 2468? In the end, we selected FRC3310 first overall, and picked up FRC3035 with the 24th pick. I was shocked by some of the amazing robots left on the table. 3035 was one of the top scoring robots at the event, based on our scouting data. They were good for 10+ objects a match. Knowing the amount of firepower we had, our strategy was pretty straightforward. Let’s go hard on offense, and see what the other alliances show us. Based on their reactions, we’ll counter accordingly. Apparently, with 3310 we only need one of the forks… Good to know. We knew we had the 3310+148 double climb to get us an advantage (or at least keep us even with the other alliances who had a double climb). We knew we had a LOT of scoring firepower. We knew 148 + 3310 had both shown success playing through a defender in the elimination rounds (when we’re not tied to one specific rocket trying for that darn RP). The #8 alliance scored 107 and 101 in losing matches. The #4 alliance scored 103 and 111… and lost! That’s ridiculous. Each of these alliances said the same thing we did: “We have a LOT of firepower, let’s go see if they can answer it.” Many people were asking “Why wasn’t there more defense?” - Well, if you’re a coach and you know your alliance has that kind of firepower, wouldn’t you use it? Again - this were incredibly close, and easily could have gone the other way. Crazy to think… the double-climb won us three elimination matches. I’m sad that we didn’t get to play against 118-2468-4063, I love each of those teams. I’m happy that 3847 went as far as they did - I’ve been the biggest Spectrum fanboy for yeaaaaaars. I’m glad we were still capable of surprising Allen in Final 1. The entire weekend was incredible, but it was exhausting. Playing back-to-back with State Championship seemed like a good idea when we scheduled it, but I was personally WORN OUT by the end. (Who am I kidding, I was worn out by day 1). Congrats to new #UILState Robotics @FIRSTinTexas #FRCTeams Champion Alliance! I’m proud of our team for staying focussed on what matters. How was the tournament overall? Yep - I think it was an adequate weekend. Happily this is one of the times when we were rewarded for our efforts! Side Note: The Boss and I do the same thing each time we’re shown a team pictures. It’s a game called “see what face James Tonthat made this time”. He never lets us down. Can you tell what’s going on here? The programming team accidentally put the “Hab 1” auton path in the selection option for “Hab 2” - so the robot drove about 4-feet shorter than it should have. To say there are big expectations is not doing it justice. I’m reminded of where we started almost 4 months ago with a very inexperienced team, made from mostly rookie members. We’ve had a great run since then, and if this is a “rebuilding year” it is one HECK of a rebuilding year. As the wise man once said… “We’ll win our share.” …one way or the other.